Tabitha Kucera is a level 3 fear free and low stress handling certified RVT, CCBC, and KPA-CTP. She is the owner of Chirrups and Chatter cat behavior consulting and training and Positively Pawsitive dog behavior consulting and training. She loves educating others through writing, behavior consulting, and lecturing on canine and feline care and behavior. She enjoys the opportunity to help people better understand and relate to their animal companions. Tabitha has worked at several small animal veterinary hospitals, farm sanctuaries, and various cat and dog rescues over the years, fulfilling many roles, including veterinary technician, trainer, behavior consultant, and more. 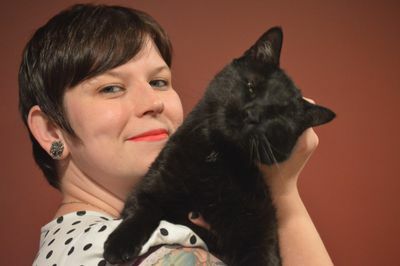 She currently owns dog and cat behavior consulting and training businesses and writes for fear free, low stress handling, and Pet Professional Guild among others. Tabitha also lectures to the general public, shelters, and veterinary professionals about cat and dog care and behavior, including how to make veterinary visits less stressful, feline friendly handling, community cats, and dog and cat body language. She has presented on various pet topics in Ohio, Florida, Portland, New Orleans, and Michigan. She currently lives with five cats (Cupcake, Chip, Malt, Norman, and Bean), her dog Ness, and her husband in Cleveland, Ohio. For as long as Tabitha can remember, she has had a strong connection with animals and knew she wanted to work with them in her professional and personal life. She graduated from Stautzenberger college with an associate of applied science in veterinary technology in 2009 and passed the veterinary technician national exam in 2010 to be awarded her license as a Registered Veterinary Technician (RVT) in the state of Ohio. She continued to teach herself more about behavior and animal care through continuing education, workshops, completing her low stress handling and fear free certification, becoming a Karen Pryor Academy Certified training partner, and a Certified Cat Behavior Consultant through the IAABC. She currently attends conferences and completes continuing education to stay up to date with animal medicine and behavior. Tabitha is currently pursuing a veterinary technician specialty (VTS) in behavior.